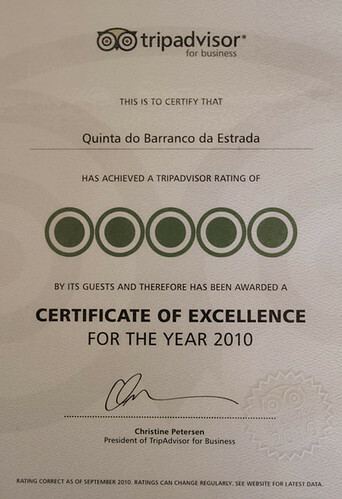 Tripadvisor-0318, originally uploaded by Paradise in Portugal. We got this in the post today and we’re absolutely blown away by it! We realise of course that we’d never have received it but for all of our guests this year who contributed their time by writing a review on us, so may Daniela and I take this opportunity to thank all of you – and of course all our staff this year who worked so hard to making the Quinta a success, Fatima and Dulce of course, but also those who volunteered their time here, Marcus, Susanna, Des, Shirley, Brian, Steve, Araby, Maria João, Ann, Bronwyn, Elias, Flora and Carolina; this is as much a certificate of excellence for all of you as it is for the Quinta as a whole, so a million thanks to all of you. We look forward to doing more of the same in 2011!